What follows is the content of the handout for the community food systems session at Australasian Permaculture Convergence 13 in Perth, Western Australia in early October 2016. The session was led by Fiona Campbell and I. IN THIS SESSION AT APC13 we want to delve into the emerging fair food or alternative food supply chain — the path that food follows from farmer, through food processor, to distributor to eater. Fair food is food produced and distributed in ways that are regenerative of natural resources, provide a viable income to the farmer, economic and employment opportunity to food producers and distributors and that deliver affordable, quality food to eaters. The alternative food supply chain, as the fair food supply chain is also known, is so-called because it offers choice in the way we obtain what we eat and, where it is available, offers an alternative to the big, industrial food chain dominated by a small number of corporations. The strategic questioning methodology known as ORID is a way we can approach our thinking about the fair food supply chain in a structured way. O — Objective: what do we know? R — Reflective: What do we think of it? I — Interpretive: what does it mean? D — Decisional: what do we do about it? who makes up the community food movement? What organisations? what issues do they address? what has been working well in the movement over the past ten years? 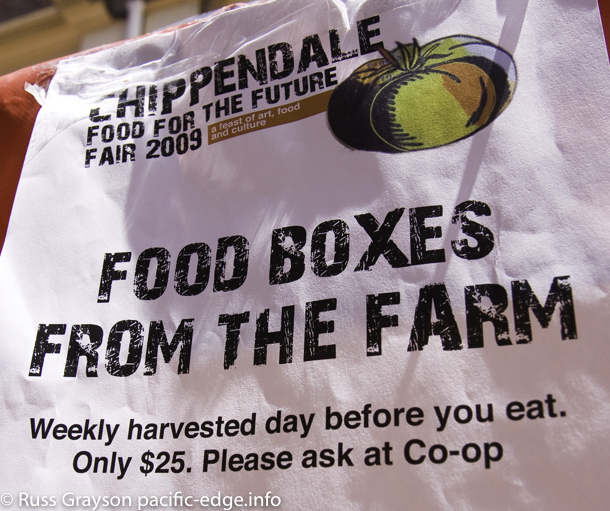 what have been some of the changes within the fair food movement? what would it take to create a more successful Australian community food movement? what part do we all play in building this community food movement? We can imagine fair food organisations occupying points on a continuum. at the other end of the continuum are the national food advocacy organisations like the Right To Food Coalition. The food advocacy organisations create the political and economic space in which fair food producers, processors and distributors can flourish. By advocating supportive government policy, by defending the small commercial and community growers and the new food distribution systems from bad government policy and industry actions, the advocacies develop and defend the freedom and operating space for fair food farmers and food distributors to grow in. What are the main national political advocacies in Australia? Right To Food Coalition: A broad coalition with focus on food security and nutritional health. Food Connect Foundation: Brisbane-based, the Foundation supports the development of a resilient food culture and the organisations involved in it; the Foundation is connected to Brisbane Food Connect, the city’s major food hub developing the alternative food supply chain. Sustain — Melbourne-based entity describing itself as a ‘meta food network’ connecting other fair-food-focused organisations and also engaged in educational work. Australian Food Sovereignty Alliance: A focus on food sovereignty — the right to choose the foods that eaters prefer and for farmers to produce food in ways they prefer. AFSA has both a farming and urban food distribution focus and is presently accumulating funds to support farmers overburdened by regulation. Urban Agriculture Australia: An ACT- based group presently networking urban agriculture interests in the ACT and working on the Canberra City Farm proposal. Urban Farming Tasmania: Growing and sharing ecologically-produced food and furthering agricultural biodiversity through seed saving and distribution. A barrier to the development of fair food in Australia is the supermarket duopoly of Coles and Woolworths. The economic strength of the duopoly has brought unfair pressures on farmers and Australian food processors and brings it control over 70-80 percent of Australia’s food and grocery market. Controversies over supermarket industry treatment of Australian farmers has attracted public support for farmers. Building on this sympathy for farmers and Australian food processing industries offers an avenue of action to fair food advocates to highlight the situation of small-scale Australian farmers, the food processing industry and the quality and affordability of food offered to eaters. The number of national and regional food production and advocacy organisations operating in the fair food space has grown since 2010. Now, the opportunity exists to establish a fair food system in Australia. Work has already started with recent food production initiatives and the emergence of fair food advocacy organisations. What needs to be done to make this movement stronger? What do we know about the scale, structure and direction of the fair food movement as it presently exists? What are the barriers the movement faces? What opportunities can be exploited? The fair food movement has no clearly defined and stated focus agreed to my most or all food production, distribution, food processing and advocacy organisations. Each organisation does its work, however communication and coordination between them could be improved.Developing a common program that organisations rally around could bring together the different organisations in the fair food movement. The means of enacting a common program would be the work of the different food advocacy organisations in their particular areas of operation and influence, combined into a single focus. Any plan of action or common direction needs to be general so as to incorporate the different organisational structures, demographics and foci. It would probably be better not to develop even a generalised plan and agree instead on a common vector, a direction to follow. That avoids detailed planning, which can be left to the individual organisations. All social movements require self-monitoring to assess that what they do is effective. Being effective means achieving what you set out to achieve. A means of doing this would be necessary for any social movement moving towards a common, overall goal of developing a fair food system. A fair food movement is already being built in Australia. It can be strengthened through communication, cooperation and a common goal that brings focus. How that would be done could form the focus of a national conversation among fair food production, distribution and advocacy organisations. Biographical note: Russ Grayson is a citizen journalist with experience in print, radio and online journalism and photojournalism. With others he taught the Permaculture Design Certificate in Sydney. He was a member of Sydney Food Fairness Alliance, a founding member of the Australian Food Sovereignty Alliance and has advised and worked for local government on policy directions for community food gardening and in the establishment of gardens. Russ has project managed food security and farmer training programs in the Solomon Islands.